The first video recording machine was invented in the USA as long ago as 1951! but it was not until the 1970s that domestic video recorders became commonplace. The first recording machines available for public consumption were bulky reel to reel affairs -followed by various different types using different sizes of (very large) cassettes. These early models (mid 1970s) were very expensive and only a privileged few of comparatively wealthy individuals could afford them. Not until 1977, when the Japanese company ‘Matsushita’ introduced VHS recorders (under their JVC and Panasonic brands simultaneously) did video recording become a realistic possibility for the masses. 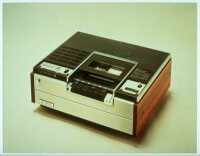 At about the same time ‘Sony’ launched its own competing video recorder in the Betamax format. Betamax was, in fact, a superior format, having better picture resolution and better sound quality. Indeed, an even better format was introduced by Philips (and copied by Grundig) in 1980. This was ‘Video 2000’ which had much better quality pictures and sound and a much longer recording capability- achieved by recording both sides of the tape – 4 hours on one side, then turn the tape over and record another 4 hours on the other side! I purchased my own first video recorder in 1978, I bought a Panasonic VHS – a friend had purchased a Sony Betamax machine. I remember conducting my first experiments in transferring VHS to Betamax and vice versa. Little did I realise then that terms like “transfer Betamax to DVD” and “copy VHS to DVD” would become such an important part of my life in the 21st century that was to follow some twenty two years later. During this period, Emily and I were so preoccupied with running our retail business (we had many discount foodstores 1976-1984) that I had not really recognised the potential there was for establishing a very successful business by embracing this ‘miraculous’ (yes it WAS at the time) technology. Not until we had sold our retail business and went on holiday to The Gambia in February 1984 to celebrate, did the opportunity hit me like a ‘bolt from the blue’. Whilst relaxing in the idyllic surroundings of the luxurious hotel, just outside the Capital -Banjul, I was intrigued to see a fellow guest using a very large camera connected to a ‘box’ strapped to his side. Fascinated, I asked him what it was. Of course he was delighted to be presented with this opportunity to ‘show off’ his new toy and he amazed us by actually filming Emily and me and immediately playing the recording back to us right there and then! – we viewed the playback in the viewfinder of the huge camera. That was a life changing moment, we established ‘Memories On Video’ just four months later. I often wonder if I would ever have thought of doing what we did if it had not been for that guy on the beach – and I’d love to be able to see those pictures he took! – he probably erased them! The format war was very good for our business! It’s in our interests for there to be lots of competing formats, the more often the format changes, the more work is available to us in converting from one to the other. In 1985, Sony introduced a new format – Video 8 (8mm video) A comparatively tiny cassette when compared to VHS and Beta. A number of domestic recorders were sold, indeed, when doing wedding videos in 1984/85 I was asked to produce my work on VHS, Betamax, Video 2000 and Video 8. The main problems with the Video 8 were its fragility (tiny tape getting mangled) and its recording capacity – It simply could not compete with the ‘Extra long play’ available by then on VHS. Video 8 was very successful as a format for a new breed of much smaller camcorder and its improved “Video Hi 8” in the late 1980s became the most popular camcorder format until the ‘miniscule’ MinDV cassette came along in 1995 – making possible the new breed of ‘palmcorders’ which are able to fit in the pocket. A final attempt to compete with the new digital technology was made in 1999 when the shortest lived of all formats “Digital 8” was introduced – doomed from the outset! Once the new tiny camcorders, using miniDV tape had arrived, the comparatively bulky 8mm camcorders faced inevitable extinction. More about camcorder history in a separate article on this website. Thus it was that the video tape had served a very important purpose in the last quarter of the 20th Century. The tape format survived well into the new 21st Century until the new DVD format became the preferred option for domestic TV recording. We started copying to DVD in 2003 and the format was very quickly established with our customers – taking over from VHS within a couple of years- to the extent that we are rarely asked to copy to VHS nowadays. – We still do, if asked to! 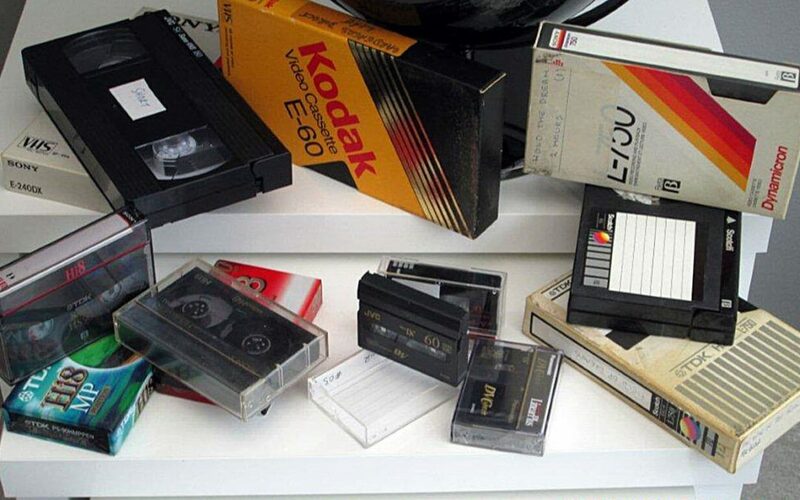 Nowadays, ‘Memories On Video’ is asked to “Copy video to DVD”,”VHS to DVD”, “Betamax to DVD”, Video8 to DVD”, “Video Hi8 to DVD”, “Digital Video 8 to DVD” – we are kept very busy.